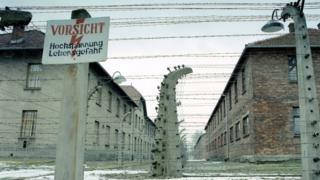 A 95-year-old former SS member will go on trial in north-east Germany next month accused of assisting in the mass murder of Auschwitz death camp inmates. The indictment says Hubert Zafke was an accessory to the murder of at least 3,681 people during one month in 1944. It says he was an SS medical orderly. The trial is to start on 29 February in Neubrandenburg. Mr Zafke remains at home, a prosecution spokesman said. The Nazis killed about 1.1m people in Auschwitz, most of them Jews. During the month covered by the indictment - 15 August to 14 September, 1944 - the teenage Jewish girl Anne Frank arrived at Auschwitz-Birkenau, the most notorious Nazi camp complex. Her diary, describing the ordeal of her family hiding from the Nazis in Amsterdam, remains a worldwide bestseller. She died in Bergen-Belsen, shortly before that camp's liberation by the British Army in 1945. According to the indictment, Mr Zafke served in the SS in a different part of the Auschwitz complex from October 1943 to January 1944, during World War Two. Prosecutors say that, like the other SS guards at Auschwitz, Mr Zafke was well aware of the camp's function as "an industrial-scale mass murder site". Last year a German court sentenced Oskar Groening, 94, to four years in jail as an accessory to the murder of at least 300,000 people at Auschwitz. Known as the SS "book-keeper of Auschwitz", he was allegedly responsible for counting banknotes confiscated from prisoners.